On Friday night, Aug. 7, at sunset, the three will have moved to form an equilateral triangle about 1 degree on a side. Over the next few nights, observers with clear skies and a great view of the low western horizon may be able to observe a triple conjunction between the planets Mercury and Jupiter and the bright star Regulus. Look for this celestial trio tonight (Aug. 7), with Jupiter, Regulus and Mercury aligning to form an equilateral triangle in the western night sky that measures about 1 degree per side. Mercury will be on top, Regulus to the left, and Jupiter to the right. Three nights later, on Monday (Aug. 10), Mercury will have moved away to the left, but Regulus and Jupiter will have moved closer to each other, less than half a degree apart. This conjunction will be very hard to observe because of its low altitude. This will probably be your last chance to observe Jupiter before it passes behind the sun on Aug. 26. Look for it in the morning sky in mid-September. On Wednesday night, August 5, at sunset, Regulus, Jupiter, and Mercury will form a line 3.5 degrees long. Jupiter, Mercury and Regulus actually began their celestial display earlier this week on Wednesday (Aug. 5). At the time, the two planets and star formed a straight line less than 4 degrees long, fitting comfortably in the viewing field of a good pair of binoculars. 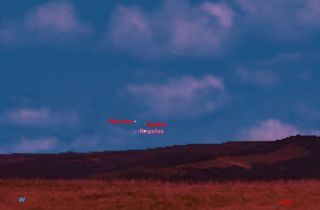 Editor's note: If you capture an amazing view of Jupiter, Mercury and Regulus that you'd like to share with Space.com for a story or gallery, send images and comments in to: spacephotos@space.com.